A Twitter hashtag created to mock Prime Minister Stephen Harper's recent comments on whether or not women have the right to wear niqabs at Canadian citizenship ceremonies was trending in Canada on Wednesday. Stephen Harper shared his thoughts on whether women should be allowed to wear niqabs at Canadian citizenship ceremonies, and now Twitter users are sharing theirs too. In fact, so many people have tweeted responses to the prime minister’s recent comments on the subject that, as of Wednesday afternoon, a hashtag meant to mock said comments was trending Canada-wide. Do you have photos or stories to share in response to Harper's niqab comments? Reach us by email at yournews@cbc.ca or by tweeting your photos to @CBCTrending. Such is the nature of digital democracy. The #DressCodePM hashtag sprung up on Twitter Wednesday morning, less than 24 hours after a debate on the oath and the niqab took place in the House of Commons. “And why would Canadians, contrary to our own values, embrace a practice at that time that is not transparent, that is not open and, frankly, is rooted in a culture that is anti-women?” he continued during Tuesday’s debate. “Mr. Speaker, that is unacceptable to Canadians, unacceptable to Canadian women..."
Both Liberal Leader Justin Trudeau and NDP Leader Tom Mulcair have criticized the prime minister’s viewpoint on the niqab — Trudeau during a speech in Toronto on Monday evening, and Mulcairon Wednesday as he left the NDP’s weekly caucus meeting. “When he talks about a culture of 1.8 billion human beings as being anti-woman — he just decreed that yesterday in the House of Commons,” said Mulcair on Wednesday. “They're trying now to back away from it, but he said what he said and that's very divisive and it's irresponsible, and it's undignified from a Canadian prime minister." Opposition parties aren’t alone in their criticism of Harper’s assertion that it's “offensive” for women to cover their faces, however, as photos on the aforementioned #DressCodePMhashtag shows. Thousands have tried to get their point across by asking the prime minister on Twitter if what they are wearing — either for cultural, practical, or personal reasons — would meet with his seal of approval. Many are also using the hashtag simply to take shots at the idea that any woman in Canada should have to seek approval from anyone, to wear anything, ever. And because Twitter is a medium that lends itself to sarcastic jokes, plenty of people cracked wise over the comments (and some of the prime minister’s previous fashion choices) too. 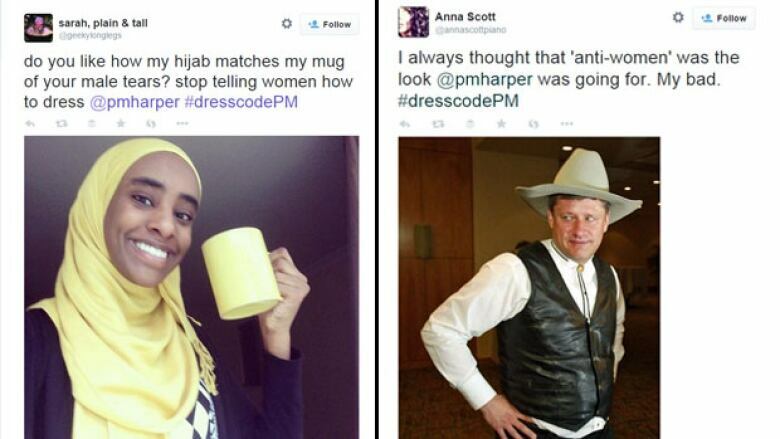 You can see what else people are sharing on the #DressCodePM hashtag right here.